"I've got the fireplace ... that burns at a hundred billion degreeeees!" 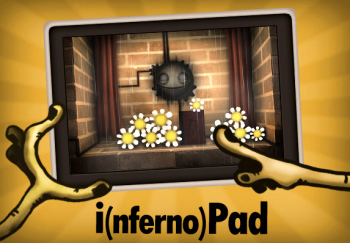 Little Inferno, the Tomorrow Corporation's cheerful little firebug puzzler, is due to hit the iPad January 31st. You too will be able to purchase Toy Pirates, Wooden Bicycles and Squirrel Whistles, and cart them back to your Entertainment Fireplace for the traditional post-purchase bonfire. These are the same folks who put together World of Goo and Henry Hatsworth, so expect cheerful visuals with a - quirky? Sure, quirky works - subtext. What you won't get are in app purchases, adds, spam and so forth, as the developers aren't that keen on upselling. The Tomorrow Corporation promises "you'll get Just The Game and nothing else!" For that matter, you can get Little Inferno in English, Spanish, French, Dutch, and German, with Brazilian Portuguese and Italian versions on their way soon. Game play is crushingly simple. You put things in the fireplace, and burn them. Each destruction yields coins, which can be used to buy more stuff for the pyre. The developers describe it as "an adventure that takes place almost entirely in front of a fireplace - about looking up up up out of the chimney, and the cold world just on the other side of the wall." And what's out there, you ask? Weeeeell ... If you have an iPad, you can find out; this one's already been out on the Wii and PC for a while. If you're one of those people who has to hear an authority figure speak out against a game before you buy it, take heart, for the National Fire Prevention Association dislikes Little Inferno. "Some will say that it's just a game!" says Fire Service Today. "True - and many will treat it as such. But there is an innate curiosity to fire." It's already calling for it to be pulled from Nintendo's virtual store.